We wanted to look into the black box between elections and legislation, and understand what sorts of collaborations and pathways were actually there. The idea we chose was immigration reform, and the tale we followed took us all over -- Iowa, Kansas, California, and Arizona, as well as Capitol Hill. We've ended up with twelve films linking dozens of fascinating people, each connected by a commitment to change the way that the United States handles the bedrock national identity issue of immigration. Together, the twelve make up one very big story -- a story that's only visible at the end of the journey. Summer, 2001: Secret negotiations between the governments of the U.S. and Mexico break into front page news, igniting a national debate on the overhaul of the U.S. immigration system that reflects the country's split over the issue. Advocates see the pro-reform perspective shared by President Bush and Senators Ted Kennedy and Sam Brownback as an incredible alignment of the stars. Then 9/11 attacks shatter any hope of comprehensive reform, but around the country, the issue dominates November's local elections. In a heated city council race in Iowa, we discover the seeds of the battles to come. Spring 2002: TEST Kennedy and Brownback have rejoined forces, though security is now the focus. Their Border Security Bill must come before immigration reform but there's a mysterious hold-up in the Senate. Finally it's revealed a single Senator is at the bottom of the delay -- Appropriations Chairman Robert Byrd, Kennedy's longest-serving and most feared colleague. Meanwhile, the White House proposes a small, immigrant-friendly provision be added to the stalled Border Security Bill. This unexpected detour creates more trouble every day it lasts. But to unlock the deadlock, what does Senator Byrd want? Summer, 2002: With Republicans in the White House and dominating Congress, the War on Terror makes politicians in either party eager to follow the President's lead. But even among Republicans, rivalries and political disagreements still have to play out in summer primaries. David Kensinger, Sam Brownback's Chief of Staff and a man who loves the game of politics, takes a vacation from Capitol Hill to guide three conservative Kansas candidates who challenge mainstream party nominees. 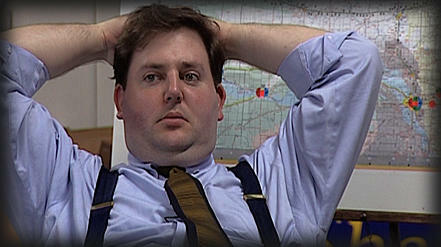 His rollercoaster summer ends on a surprising election night that previews a deep divide in the Republican Party. Summer-Fall, 2002: The Border Security Bill is now law. Kennedy, Brownback and staffers Esther and David are eager to move on immigration, but the fight over creation of a Department of Homeland Security eats up the summer. Once Republicans take the Senate in November midterms, Senator Brownback goes into "cycle" with his own re-election campaign. Committee choices for the next Congress loom, and immigration is not playing well in Kansas. Will one of the Senate's most compassionate advocates decide to give up the Judiciary Committee and his upcoming chairmanship of the Immigration Sub-committee? 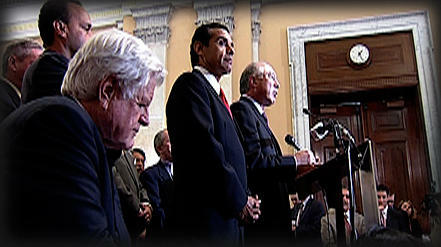 Winter, 2003: As the new Congress begins, a lot of people have ideas about an immigration bill. For pro-immigration advocates, the best bet remains Kennedy's plan. Across the Hill in the House, young staffers for two Republican congressmen from Arizona, Jim Kolbe and Jeff Flake, are quietly crafting something that sounds very different -- a revolutionary guestworker bill with a path to citizenship. Esther's not too worried as long as their bill is Republican-only, but once her rivals begin courting a Democrat, the race is on. Suddenly Esther's got a crisis on her hands. 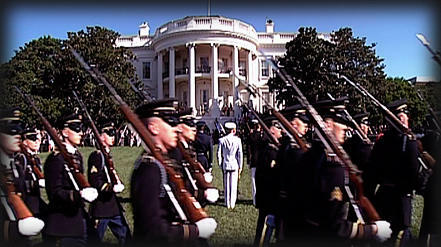 October, 2003: High school students stage a mock graduation ceremony on the Capitol lawn. Next day, the DREAM Act gets a chance. Because DREAM is a small bipartisan bill to help kids, supporters are optimistic. But anti-immigrant groups see it as "amnesty for illegals". 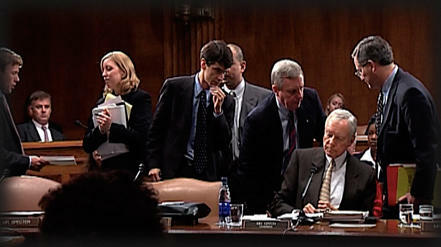 The Senate Judiciary Committee markup is heated. After two weeks, an amended version is finally recommended for full Senate debate. But what exactly did Senators agree to in the confusing markup? The bill's final language must still be defined by opposing staffers. Will they negotiate a deal before it's too late? 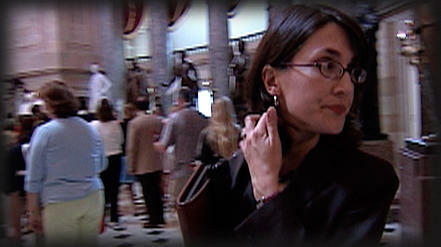 Fall, 2003: Esther, Senator Kennedy's Immigration Counsel, has plenty of reasons to worry. She's got 8 weeks to accomplish a small miracle: get business and labor to agree on a comprehensive immigration deal, and find a Republican to co-sponsor it in the Senate. Driving cross-country, the Immigrant Worker Freedom Ride buses are coming to lobby Congress, creating a very public impression that unions support Kennedy. 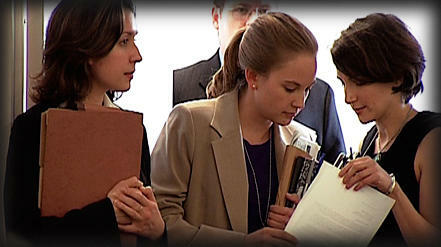 But Esther learns forces inside the AFL-CIO are working to derail her bill. Years of work, and the future of millions of families, are riding on one conversation. January, 2004: The White House looks as though it has abandoned immigration reform. But labor's opposition has also derailed Kennedy's bill, creating a political opening for Republicans in an election year when the Latino vote could be key. President Bush gives a strong speech on immigration, highlighting last summer's Arizona model and redefining the national debate. The pro-immigration community is divided. Advocate Frank Sharry determines to forge a new, counter-balancing left alliance. If Senator Kennedy and firebrand Congressman Luis Gutierrez can find common ground, the game just might swing the other way. 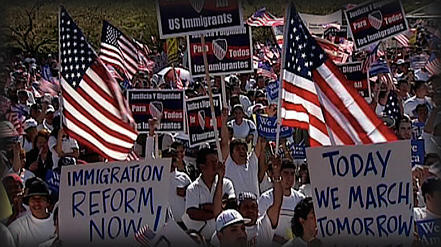 Summer, 2004: Across America, grassroots supporters and opponents of comprehensive immigration reform are spoiling for a fight at the ballot box. In Arizona, no one can ignore it -- voters' frustration is at a boiling point. 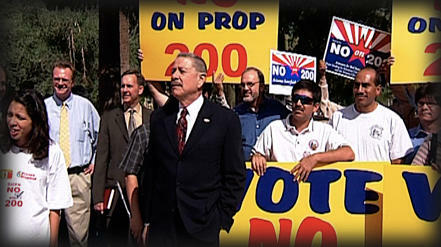 Citizens launch a wildly popular ballot initiative, PROTECT ARIZONA NOW. Alfredo Gutierrez, radio host and ex-politician, is galvanized out of 'retirement' to try to beat it. Eventually national groups see: if things go badly in Arizona, they will surely go worse in Washington. 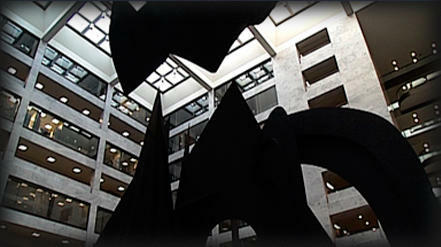 The rollicking campaign becomes a case study in local-national strategic alliances and the many ways they can founder. Fall, 2004 - Spring, 2005: Congressmen Kolbe and Flake's reward for their innovative 2003 guestworker bill: tough primary challenges in 2004, facing determined opponents who capitalize on Arizona anger over 'amnesty for illegals. ' The very different campaigns, both hot and colorful, leave the winners vowing to do something about immigration. By winter, staffers for Kennedy, McCain, Kolbe, Flake, and Democrat Luis Gutierrez all sit down in the same room. Can they join forces to combine the best of earlier, competing bills into the first bipartisan, bicameral Comprehensive Immigration Reform ever introduced in the U.S. Congress? January, 2006: The House just passed the toughest anti-amnesty, enforcement-only immigration bill in history. Immigrants feel targeted, and 'Sensenbrenner' (the bill's sponsor) becomes a household word for Latinos. Finally the Senate tackles immigration reform. Millions of people take to the streets all over the U.S., marching until a bi-partisan compromise modeled on last year's Kennedy-McCain bill goes to the Senate floor. But leaders in both parties seem to want an election issue, not a bill. Advocates smell a double-cross, and go public with an attack. What will it take for the Senate to respond? Spring, 2007: This year, immigration advocates and grassroots expect great things. But Senator Kennedy has lost his partner McCain to presidential primaries, and the Republicans now put a very different offer on the table. Deep at the heart of this fast moving story, we find a moral tale of modern American politics. Ted Kennedy - one of the handful of people who through his personal efforts truly changed the face of America - will be forced to decide how much he wants the deal, and what he is willing to trade for his greatest legacy?